Where is your donation going and how much is going to charity? 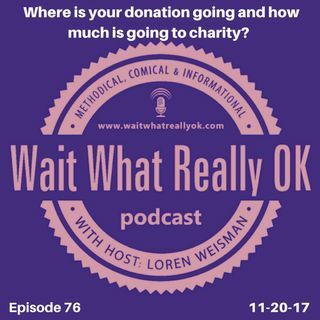 Wait What Really OK Podcast Episode 76 hosted by Branding Strategist and Keynote Speaker Loren Weisman talks about the holidays, the giving spirit and the realities of many charities, charitable events and the breakdown of how much of your dollar is actually going where you think it is. Digging in to the question and the often unfortunate answers addressing charities and those charity events that seem to show up even more ... Más informaciones often during the holiday times. Where is your donation going and are you sure the right amount is going where it should? Now, every non-profit and event has an overhead and costs, but there are a lot of events and non-profits that are practicing some shady approaches that leave a limited amount of your donation or you gift going where you want it to go. By practicing that extra amount of due diligence and looking into the non-profits and the events you are giving to or taking a part in, you can make sure that the money you donate has the highest percentage of making the highest percentage of it en route to where it belongs. Episode 76 “Where is your donation going and how much is going to charity?” of the Brand Management and Marketing Podcast Wait What Really OK is available on iHeartRadio. Podcast Blog Supplement for Episode 76 of the Wait What Really OK Podcast with Loren Weisman. Podcast Link Supplement for Episode 76 of the Wait What Really OK Podcast with Loren Weisman. Either be a good parent to your career or just give your dream up for adoption. Podcast Video Supplement for Episode 76 of the Wait What Really OK Podcast with Loren Weisman. Podcast Photo Supplement for Episode 76 of the Wait What Really OK Podcast with Loren Weisman.